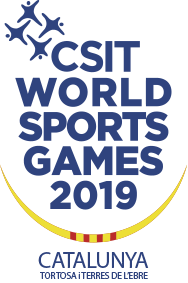 Medallists from last senior of any World or Continental Championship and athletes placed in the Top 50 of the WKF Seniors World Ranking cannot participate in CSIT Karate Championships. More than one team per gender per Union can participate. Each team with more than 4 members needs to bring at least one Referee with at least WKF national license. Note: Age group Masters can be further divided in more age sub-categories. CSIT Karate Championships are opened to all karate styles and to all karateka’s. WKF accepts kata of all karate styles. Only original karate katas are allowed on the competition although slight variations are allowed. For that reason, there is an official kata list published in the latest WKF Kata and Kumite competitions rules in the chapter KATA RULES with a list of Kata allowed at the competition. Competition system can be elimination system with repechage or round robin (matrix) system. Selection of the system will be based on number of registered athletes and will be defined for each category separately after registration. Only referees with at least a valid national WKF licenses can arbitrate in the competition in order to ensure a quality refereeing, smooth running of the competition and safety of the competitors.